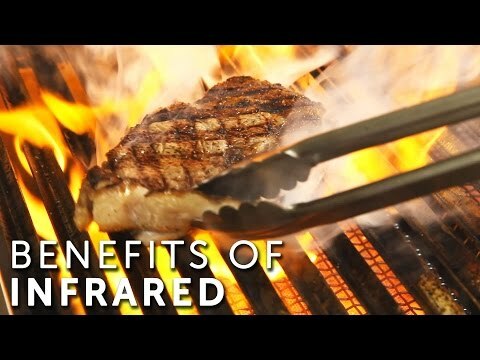 This ProFire Professional Deluxe Series hybrid natural gas grill features three controlled grilling zones with four 11,000 BTU stainless steel burners, and a 32,000 BTU ceramic infrared searing zone that push 76,000 BTUs of total cooking power on the grilling surface, and a 11,500 BTU Infra-Roast rotisserie burner. A heavy-duty stainless steel rotisserie motor supports up to 50 lbs. The 16 gauge, commercial grade stainless steel flavor plates are self-cleaning and distribute heat evenly over the entire 714 square inch cooking surface while minimizing flare-ups. The grill is constructed of commercial grade stainless steel with a sleek, curved double lined hood and polished mirror finish. The 5/16 inch stainless steel cooking grates are spaced more closely together than other grill models to better accommodate small items. 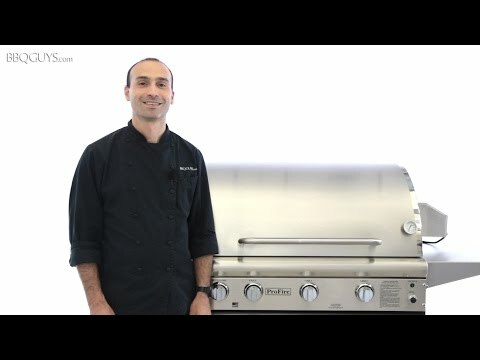 This ProFire Professional Deluxe Series grill also comes standard with a stainless steel warming rack, a stainless steel smoker tray, dual purpose thermometer, and electronic multiple spark ignitor to enhance your grilling experience. Island opening must have a floor to support the grill or the island trim kit should be purchased. 33 3/8 X 20 1/2" 32 1/4 X 20 1/4" 27 X 21" 27 1/4 X 19"